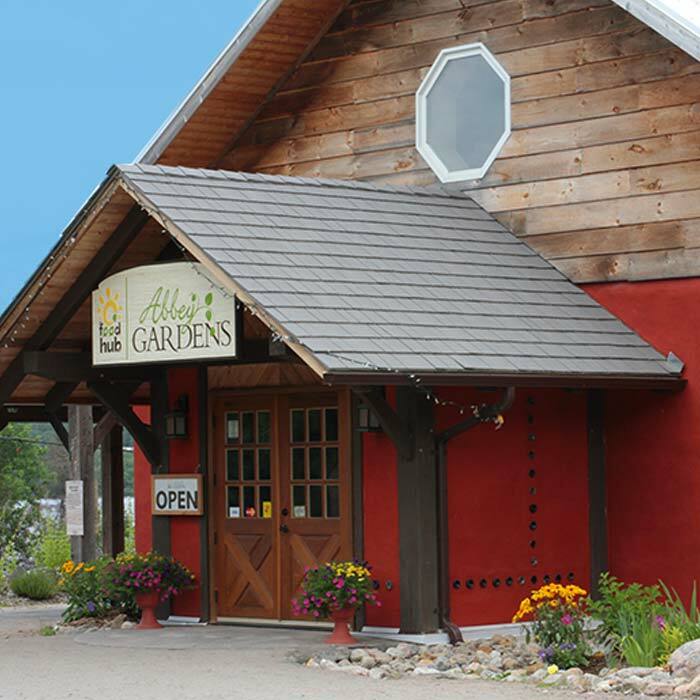 Our gardens, hiking trails, Food Hub, educational displays and local business partners (including a craft brewery) are all located on site in the beautiful Haliburton Highlands, Ontario overlooking Grass Lake. Visitors are welcome to tour the gardens, visit our heritage breed ponies and chickens, shop for local food at the Food Hub, enjoy lunch on our new restaurant patio, book a tour of the grounds, hike the trails or participate in one of our programming options. Enjoy a selection of seasonal sandwiches made on freshly baked buns (vegetarian and meat options available) during regular business hours. Enjoy your lunch on our new screened-in porch! 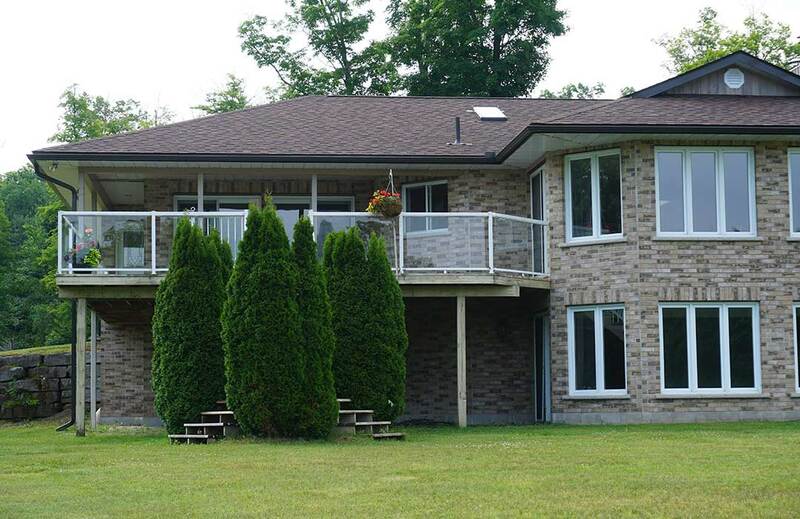 Abbey Gardens is located on a glorious heritage parcel in the Haliburton Highlands. 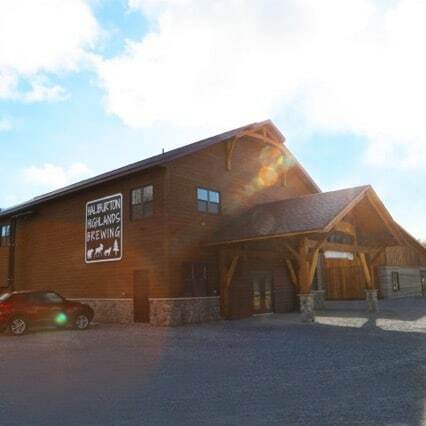 For the past several decades this 310-acre parcel of land has operated as a gravel pit, helping to pave the way for growth and development in Haliburton County. Now our community is gathering around efforts to remediate the site and create a stunning visitor attraction. 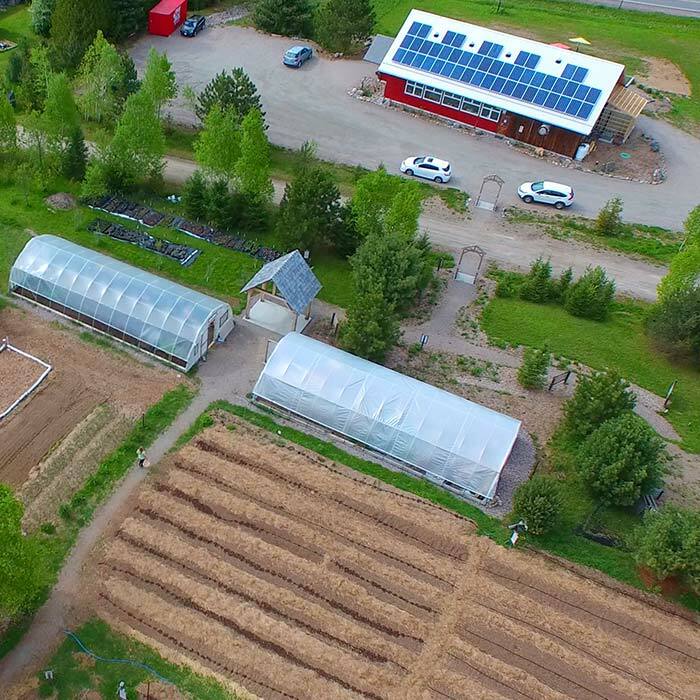 The purpose of the Food Hub is to create demand for and provide easy access to local food. We classify local as any product grown (vegetables), made (preserves) or packaged (coffee) within a 200km radius of the Food Hub. We prefer organic or sustainably-grown products, but will carry conventional and label accordingly. In any case, local comes first! Approximately 10% of our product mix is sourced outside of the 200km radius. When there’s customer demand for complementary products (ie. seasonings) we will carry them. 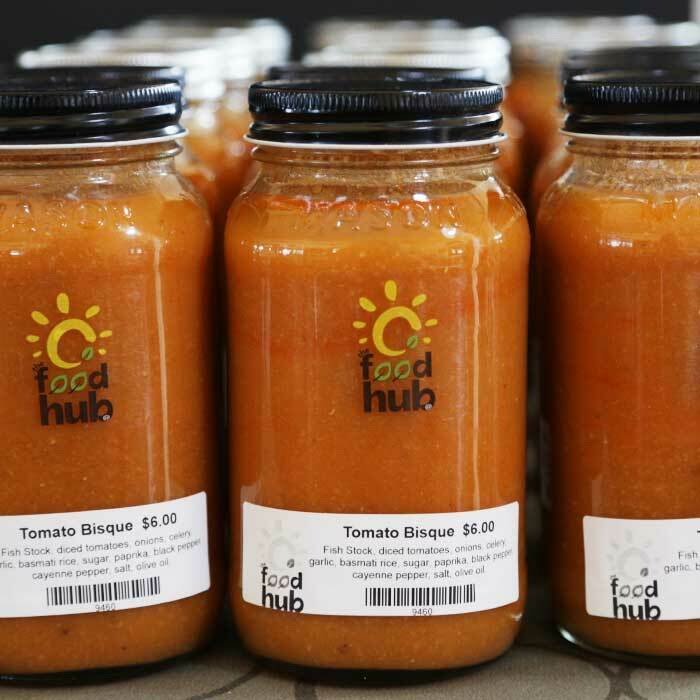 The Food Hub operates as a social enterprise, so any profits go directly back into the project to help support educational programs and facilities. 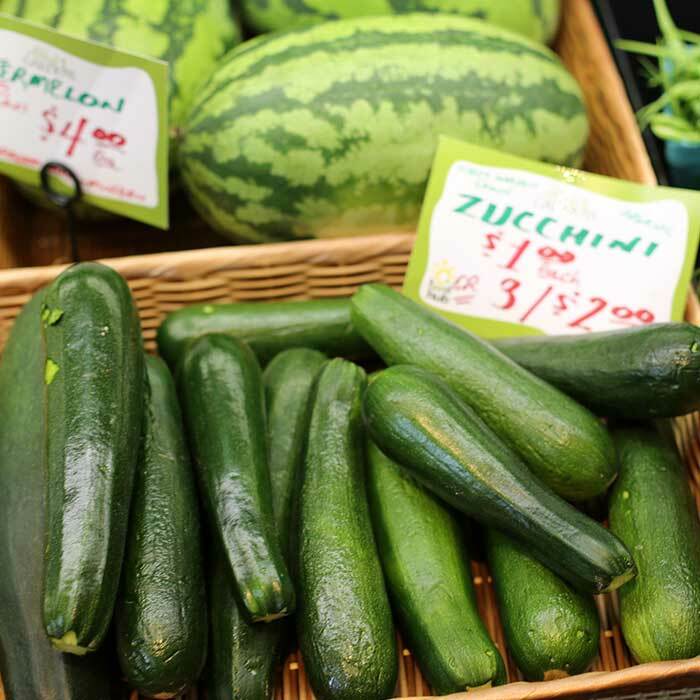 Shop from a wide assortment of local food. 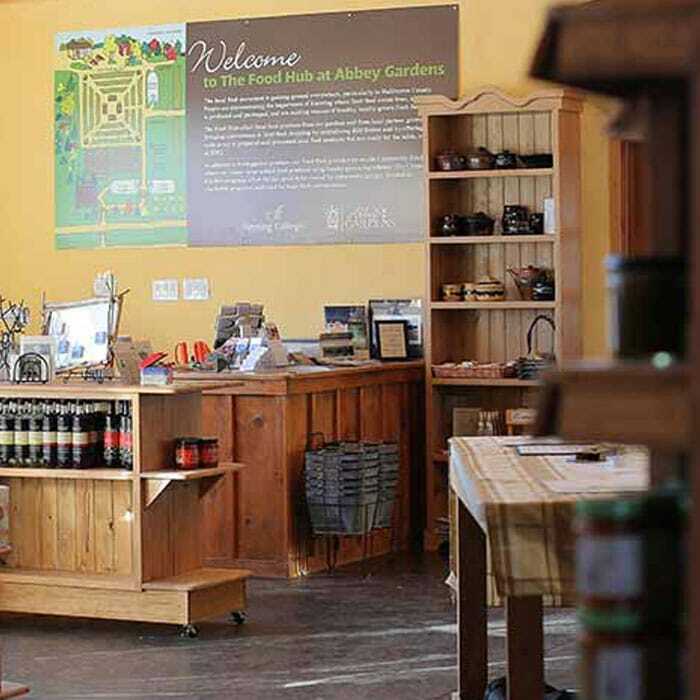 Fresh vegetables from our own garden and neighbouring farms, homemade salads and preserves, fresh-milled grain products, organically raised meats, dairy and locally made products. 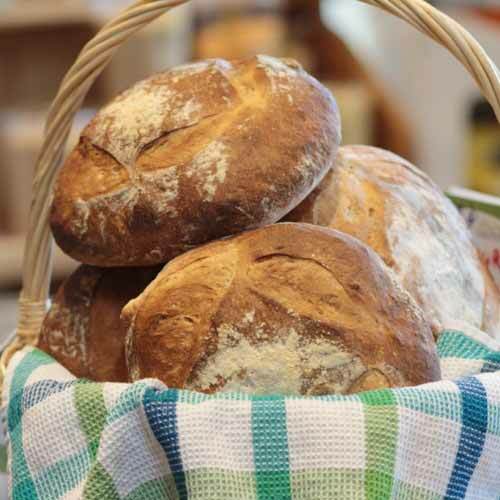 We also sell coffee and breads from County Coffee and Into the Blue Bakery. Abbey Gardens welcomes like-minded, start-up and established organizations to locate on our site. These partnerships help make the site more of a destination for the community by clustering attractions together. Our nano-brewery features a variety of ales, porters and stouts. We’re located on the Abbey Gardens property-just follow the signs past the Food Hub to 1067 Garden Gate Drive. We’re also on tap at a variety of restaurants across Haliburton Highlands. Into the Blue Bakery is founded on the principles of bringing healthy pizza alternatives to residents and visitors of Haliburton County. We source local ingredients when possible and change up our specials weekly depending on what’s in season. We believe in supporting local food initiatives. 5% of profits go to organizations working on local food initiatives! 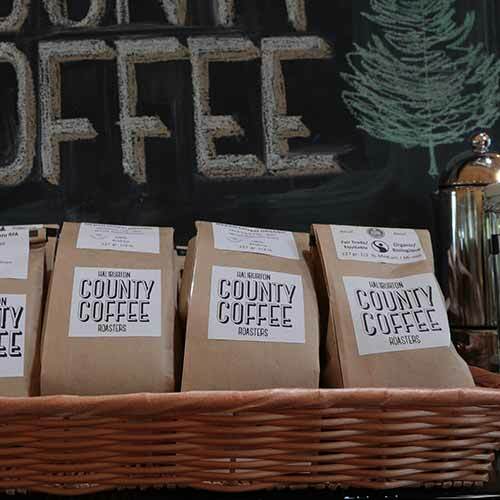 County Coffee roasts fresh coffee beans in the Food Hub at Abbey Gardens. Roasters David Buwalda and David Patterson concentrate sourcing ethically-traded single origin green beans which highlight the best characteristics of different regions. This season’s beans are mainly Central American and yet are each very distinct. We have also brought in a decaffeinated bean from Sumatra which has everything that a great coffee should have, only with less than 1% the caffeine. As every region is different so are the conditions in which Coffee producers labour and we have selected our beans according to ethical trade, health, and environmental certifications. We feature organic, Fair Trade, and Rain Forest Alliance coffees. Our decaffeinated is done without chemicals using the Swiss Water Process. Our coffee is available for sale through the Food Hub. Haliburton Solar and Wind was established in 2013 to provide clear and reliable energy solutions. Energy solutions are complex and our clients specific needs are carefully considered. 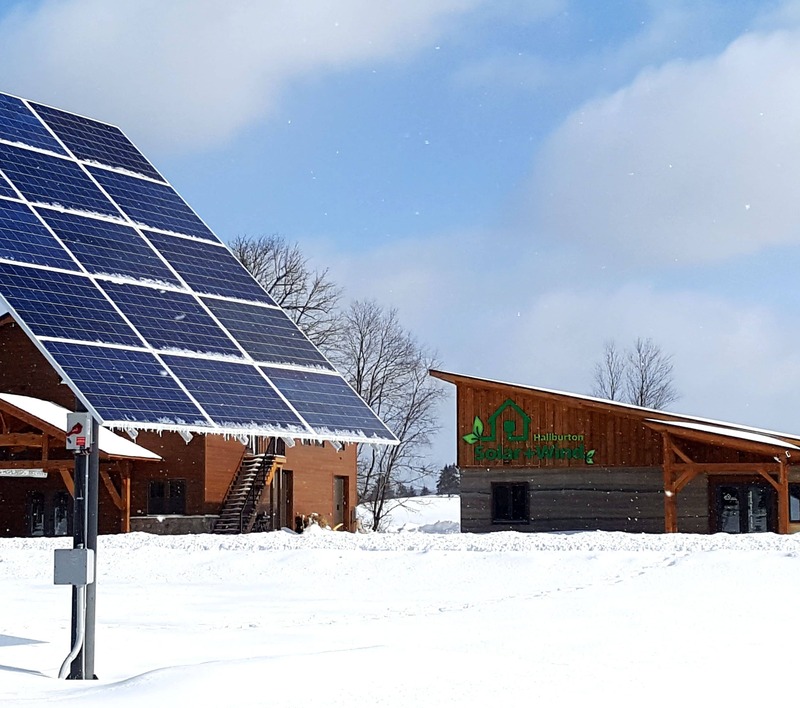 Haliburton Solar and Wind is an award winning design, consultation and installation company that strives to ensure that alternative energy projects are flawless and reliant. We accomplish this by working closely with all our clients to decipher their unique needs and discover and define their objectives by putting a plan in place through a consultative approach that provides complete solutions that work! ARC was born of a vision to advance the integrative cancer care in Canada and has expanded to include other wellness themes. ARC offers a sanctuary experience based on an integrative, whole person approach to healing and wellness. The purpose of the retreat format is to transport people living with cancer (as well as their support person) out of their day to day lives – to focus on life enhancing choices for their mental, emotional, physical and spiritual health and well-being. Abbey Retreat Centre also offers day programs that highlight ARC’s focus on whole person care. This complementary programming is offered based on local interests, such as horticulture, meditation, yoga, art, cooking, etc. These programs may be offered in partnership with Abbey Gardens and/or other local businesses/groups. If you would like to partner with ARC in offering Wellness or other programming, please contact us. 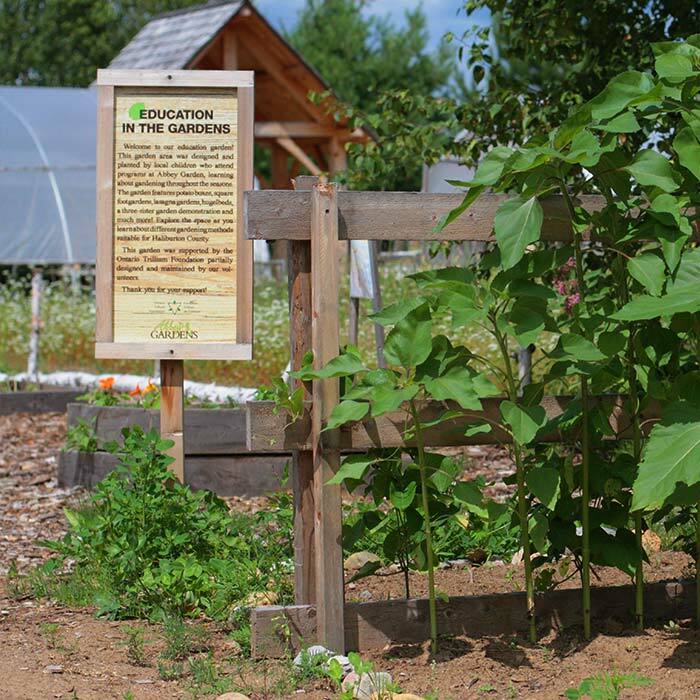 Visitors are welcome to explore the garden rows while learning about gardening through our interpretive signs. 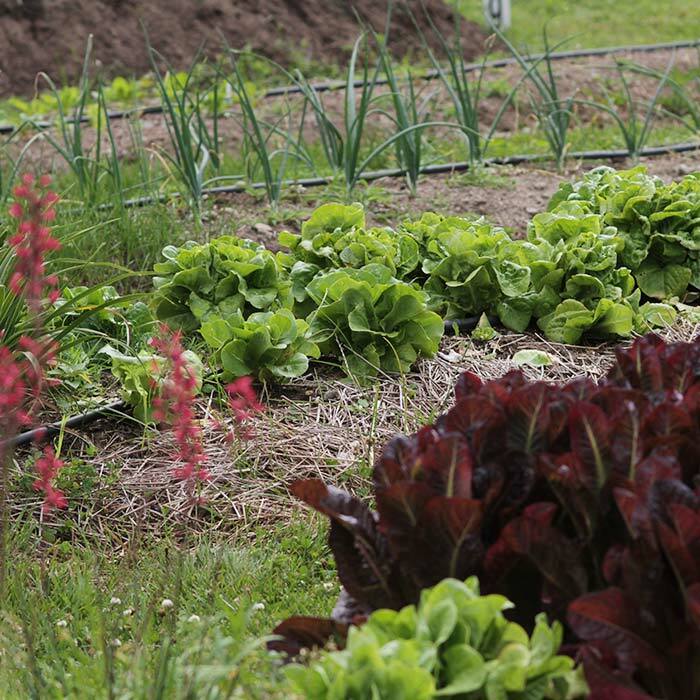 Our gardens feature food and flower varieties, permaculture gardening techniques, and interesting ideas in sustainable agriculture. 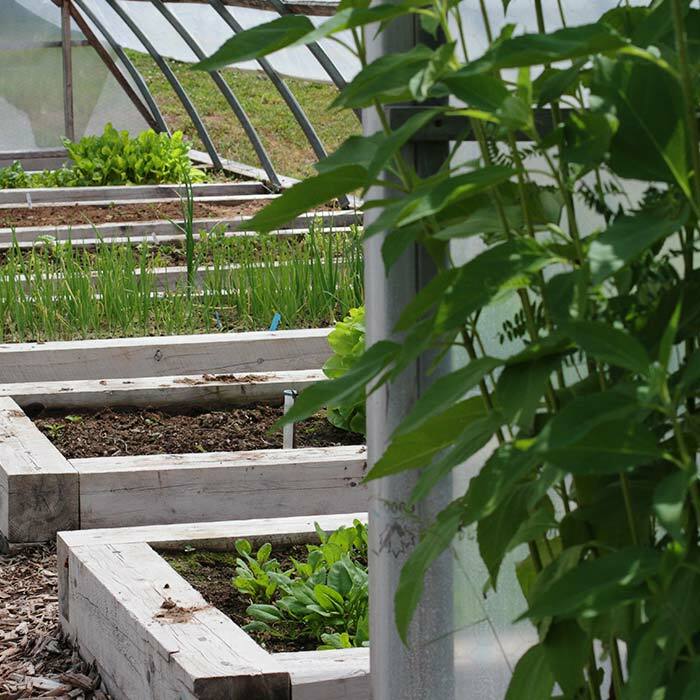 We currently have 2 acres of vegetable gardens, an education garden, backyard composting demonstration, pollinator gardens and hoop houses. All of the vegetables grown in the garden are sold fresh on the Food Hub shelves or processed in the kitchen into value-added products. 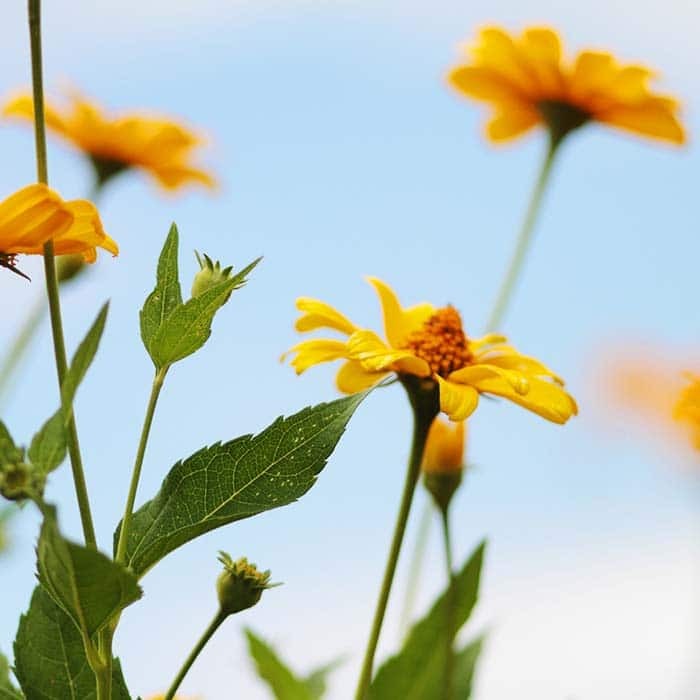 We offer guided and self-guided tours of our property, gardens and organization. Contact Cara about custom or private tours. All tours are by donation. Alternatively, explore the property and gardens as you read our interpretive signage, or grab a children’s passport to go on a fun, scavenger hunt! Biodiversity in agriculture is critical to food security and Abbey Gardens is committed to preserving and demonstrating heritage livestock. Their genetics have evolved over centuries of farming to be well adapted to our environment, and resilient to pests and disease. In an age of factory farms and genetically-modified food sources, supporting heritage breeds is one important activity in support of food security and resilience. At Abbey Gardens, we showcase two rare breeds: Lac La Croix Indian Ponies and Chantecler chickens. Lac La Croix Indian ponies are a Canadian breed, and by the 1970’s, the breed was virtually extinct, with only 4 ponies left living near a small village in northern Ontario. Through the rescue and rehabilitation efforts of a dedicated group of individuals, there are now approximately 200 ponies on record. The Chantecler is a breed of chicken originating in Quebec in the early 20th century. With plumage that lies tight against the body and an exceptionally small cushion comb and wattles (to protect against frostbite), the Chantecler is one of the most cold-hardy chickens and is suitable for both egg and meat production.